2scoops had the most liked content! I am interested in any old trooper axle parts you may have lying around. Please let me know if your want to sell them. Backstory: Hey everyone. 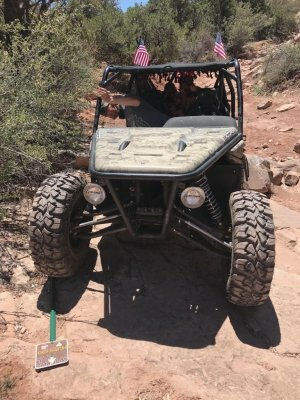 Last trip out to moab I climbed a wall on poison spyder Mesa while 2 rzr xp1000's and three can am x3 xrc's watched me and didn't dare try. After doing it once I pulled around to show them it wasn't a fluke. One on the can am x3 xrc drivers just looked at me and said "that's steep". On the second try I spread the bell on the left rear axle. I made the climb but now the inner cage slips inside making a loud popping noise as twisting the boot. I mainly just need the inner bell but I am interested in anything you have. Can anyone tell me WHAT I bought?? It's badaass that's what it is! You gotta rock that thing. The rzr and can am owners are getting tired of looking of looking in the mirror (that's deep if you get it). Are you driving around with your locker on all the time? This is especially tough in your machine if it's on pavement. Does it clunk when the locker is disengaged? How many miles on you machine? Can you tell how play? 1/8 th of a turn? Some play is normal. I don't ever recall anyone attempting that on this forum. If it were me I'd keep it rear drive and put a Honda motor in it with more HP. Looking good. Nice work. Although... Something doesn't match and I can't take my off of it. Honestly never needed one. Once my buddy with a can am maverick wanted to adjust his springs so we used a piece of firewood, wedged it under his rear diff and he pulled forward. Worked awesome. In my opinion farm jacks (high lifts) are way too heavy for a sxs to be carrying around. I would carry a scissor lift or air bag if I carry anything, but I think I can get by with a rock or wood for a trail fix for now. Yeah, I did try and post some on the site but the file was too big. I will work the Google drive thing when I get time. Should be the exact same transmission. I am sure Google could answer for sure. Same engine same transmission as the T2. Bought a renli 1100 that was involved in a fire. Have some parts for sale : Chery 1100 short block motor turns well. Definalety rebuildable. Transmission will need new sensors and maybe seals. Welcome to the forum. I don't get on here as much as I used to. Man, as far as I know not many troopers had a ps pump. Can you get pictures? I suggest finding alternative sources on as much as you can. If you can find an alternator or ps pump at the local autoparts store then you can just get it whenever and not have to order. I am certain there is info on this forum about another type of alternator that will work. Just keep searching.